Traditional advertising dates back to the time of the 18th century, when advertising was done through the means of radio and television only. But with the advent of modern means of media like the internet, the trend and the means of advertising changed. Now, people prefer internet over all other ways to media. The internet is capable of providing everything from news, videos, as a social medium to buying and selling of product and services. This has resulted in the decline of traditional media use. Though, traditional advertising is still an effective way to create your brand name and engage more traffic, but is not economical to be used by all businesses. Advertising on television and radio is still a costly affair and not all businesses, especially the startups are capable to spend such big amount of money in a go. This is the main reason digital marketing has become so common platform among businesses to reach the potential audience. Moreover, reporting stats by means of traditional advertising, reporting ROI to the client is more challenging than in the case of digital advertising. 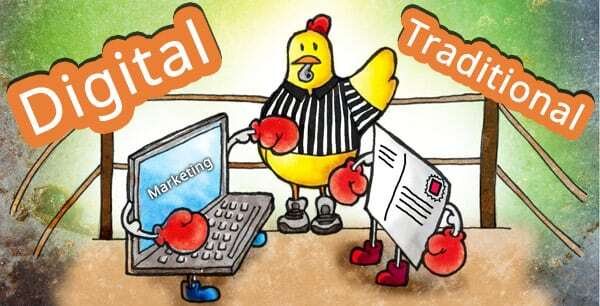 Digital advertising enables reporting of exact ROI through different campaigns and changes can be carried out easily. The costs in case of digital advertising are easier to maintain and it is easier to know the mode of payment and fetch the information of recipient. In case of traditional advertising, the costs are difficult to estimate. It is difficult to prepare the appropriate budget due to varied incremental costs due to market behavior and time slots. There are built-in reporting tools provided by search engines that enable easy and accurate metrics within reasonable time. Some of such generating tools allow the end user to even prepare their own custom reports. Traditional advertising uses manual entry of sales data while running a marketing campaign which makes it more likely to be inaccurate. Also, it takes into use support software for input and creation of reports. Calculating ROI this way could be trickier and still would not be as accurate as in case of digital advertising. Targeting audience is very much accurate with digital advertising. The various platforms available for advertising like the Facebook, Twitter provides the option to set your target audience through your website visitors, email databases, etc. It’s difficult to target a specific audience in case of traditional advertising. In case of print ads, even if your outlet has millions of subscribers, it’s less likely that it would be read by all in full. Moreover, in case of television ads, people generally ignore the ads by skipping to different channels. Same is the case with radio ads. Therefore, by certain means digital advertising is hailed more by businesses instead of traditional due to solid reasons.